Braised Veal with Garlic, Thyme for Cooking gourmet main course. Mediterranean cuisine uses a lot of garlic. The Spanish like it raw, rubbed on bread. The French like it whole, cooked to a beautiful, smooth creamy purée, which is what we are doing here. I peeled the garlic cloves... but it's really not necessary. Just pinch the cooked garlic out of the skin to eat.. As is so often the case, this will be enough for 4 persons or 2 meals. Cut veal into 1 1/2 inch (3.75cm) cubes. Separate garlic head, peeling cloves if you like. In a deep, heavy pan heat the oil over medium-high heat. Add half of the veal and brown on all sides. Remove and brown the other half. Remove. Add the bread crumbs, wine and stir well, scraping up the browned bits. 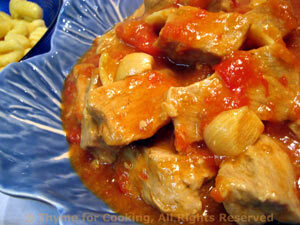 Return veal to pan, add garlic cloves, tomatoes with juices and bay leaves. Bring to a boil. Cook gnocchi according to package directions. Drain. Turn the heat up under veal and uncover. Give the cornstarch mixture a stir and add to the pan a little at a time until thickened to your liking. Spoon meat, garlic and sauce into a bowl and serve with gnocchi.